I bought Linda Permann’s book, “Crochet Adorned” and have been very inspired by her projects. She shows how you can use crochet to embellish bought garments. I have been doing this for years since I don’t have as much time as I used to to crochet large items but she gave me some new ideas. I love how this technique makes ordinary garments “extra-ordinary” with a personal touch. Here is a Pink Wavy Butterfly top I made for my daughter. Every year I like to make at least one outfit for each of my daughters. Since they grow so quickly, it keeps me on my toes to make them something before the season wanes and they are too big. 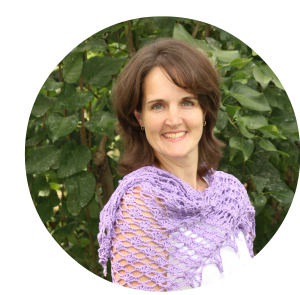 One of the projects in Linda’s book inspired me – she had a woman wearing a simple top with crocheted squares on top and a simple fabric bottom. I wanted to try a different design from the squares and had fun experimenting with the colors and “wave” pattern.